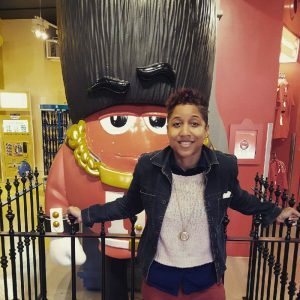 Jamilah Corbitt is a digital marketing maverick and the visionary leader of i am a brand® – a digital agency that equips companies with the tools to build customer-centric digital communities. She is a social media influencer and an award-winning keynote speaker who helps entrepreneurs and professionals build brands that BOOM. She shares educational and entertaining content via Facebook Live and on her YouTube channel. Assisting entrepreneurs and professionals in leveraging their authenticity to drive revenue is what Jamilah does best – and in 2014, she was recognized as one of the Top 30 Under 30 people to watch in the Washington, D.C. area. In 2016 she also received The Star Award in London UK, which recognizes the impact of 100 women from across the world. Jamilah is a Washington, D.C. native with a passion for personal and professional growth. At age 10, she formed JAC Publishing Company and began designing and selling greeting cards. At age 11, she taught herself how to code and published her first website, and at age 16 she was a high school McDonald’s All-American nominee in basketball and earned an athletic scholarship to an NCAA Division-I institution. As an active member of the community, Jamilah is a proponent of building authentic relationships. She is the President of her local Toastmasters chapter, and is the former Chair of The Young Executive Society at the Tower Club in Tysons Corner, Va.
Jamilah’s magnetic personality, spirit, transparency, and compassion make up her winning formula for achievement, and her unwillingness to allow failure or negativity into her life is evident in her approach to success, both for herself and her clients. As a brand strategist, her ideas are fresh. As a thought leader, she’s on the cutting edge of generational thinking and as a businesswoman, she’s been able to move forward to become the new face of entrepreneurship. Jamilah has won the hearts of many audiences through her charismatic personality and engaging delivery. Her speeches bridge the generational divide. Jamilah’s transparency, coupled with her magnetic energy, makes her relatable. She encourages people to be the best version of themselves. She consults entrepreneurs and sales/marketing teams on how to effectively leverage live video and blogging to build a loyal community of buyers. Jamilah is very inspirational! Her workshop was engaging and upbeat. She provided strategic ways to work together as a team and build a positive morale. Jamilah was truly a blessing. She's motivational, insightful and I believe she will have a lasting impact on many. Jamilah's presentation was amazing. I am truly inspired and think that everyone should be able to see this whether in person, online, or however they can see it because it was just that mind blowing. Jamilah has such a contagious attitude that makes you believe in yourself. She kept us engaged and entertained. Jamilah's energy is infectious. Her positive spirit uplifts and inspires all those in her presence.